August 2014: There are flowers on the spot where unarmed 18-year-old African American Michael Brown was shot and killed by the police. They are protesting the killing of Michael Brown. Most of the demonstrators were peaceful, but a small group wanted to create chaos. The police on their side were strongly criticized for being too aggressive and too militarized. One of the over 200 people who were arrested during the demonstrations. The police are firing tear gas at the protesters. They are trying to clean the tear gas out of his eyes. 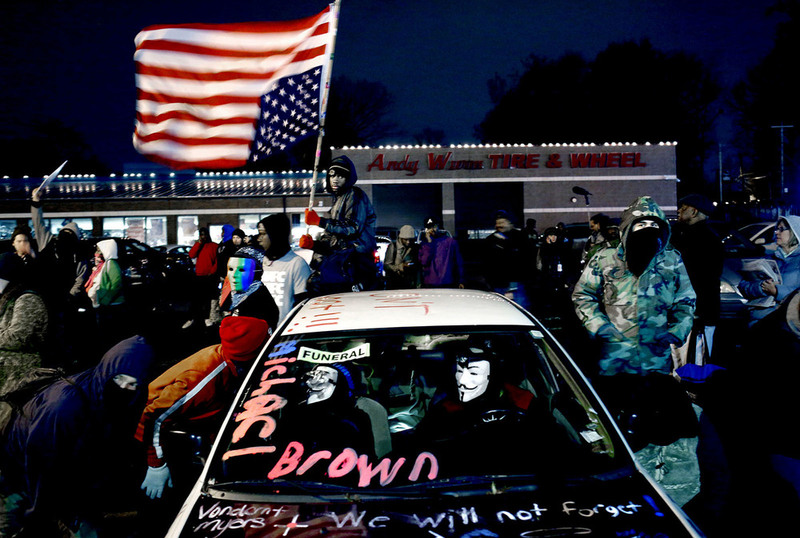 November 2014: They are waiting for the decision of the grand jury whether police officer Darren Wilson will be prosecuted for having shot and killed Michael Brown. When the news came that Wilson will not be prosecuted, the protest turned violent. Several shootings took place and local businesses where burned down. It's the day after the decision not to prosecute the police officer and the Ferguson residents wake up to the result of the violent protests.